Home | Blog | Ask Our Experts: What is an Evaporative Cooler? Here’s what an evaporative cooler might look like. What is an evaporative cooler, generally speaking? An evaporative cooler is a machine that cools air by passing dry, hot air over water, which cools the air while it evaporates. These machines are found throughout the US for specialty commercial/industrial applications and only in hot, dry areas of the US for home cooling. What is an evaporative cooler, and how does it work? An evaporative cooler is a machine that could be part of your air conditioning system at home or work. Before explaining how it works, remember that evaporating water removes heat (that is, in general – not scientific – terms). With that in mind, an evaporative cooler passes air over water, usually through a panel or series of panels. The air gives up its heat to the water, and the water “evaporates” as this occurs, removing the latent heat and lowering the overall temperature of the surrounding area. How would an evaporative cooler be implemented as part of a building’s HVAC system? In our area (South Central PA), evaporative coolers are most often used in commercial applications to cool a water source that ultimately provides cooling water to large chillers, water-cooled air conditioners, and multiple water-source heat pumps. Are evaporative coolers relatively common in South Central PA? Are they common in homes? No, evaporative coolers are not common in residential HVAC systems throughout South Central PA. This is largely due to two factors: 1) South Central PA’s higher humidity levels in the summer, and 2) maintenance costs associated with operating evaporative coolers in our area. In South Central PA, evaporative coolers are most often found in commercial/industrial applications (such as the chillers, water-cooled air conditioners, and multiple water-source heat pumps mentioned above) and are sometimes used as portable “backup” units in critical, temperature-controlled environments such as data centers or computer rooms. In the United States, you’d have to go to the desert southwest to find evaporative coolers used more often in homes (since humidity levels are much lower in this region). What kind of maintenance does an evaporative cooler require? Scale and debris removal from the water source is required, as well as ongoing fan maintenance. Additional maintenance would be required depending on the type of system that’s installed in a commercial/industrial environment. A full maintenance checklist is outside the scope of this blog post. If my evaporative cooler stops working (or doesn’t generate cool air), what are simple checks I can make before calling a pro? Check for power, adequate water supply at the source, and clean water. Check any filters for cleanliness, looking for potential blockages. Check the fan unit to ensure that it’s clean and working properly. 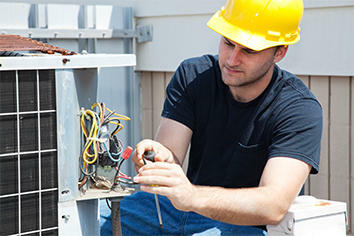 If you’re at all unsure of what you’re doing, call a professional – for safety and efficiency reasons! In conclusion, someone in South Central PA might run into an evaporative cooler installed as part of a specialty commercial/industrial HVAC system – but not as part of a residential cooling system, since summer humidity in this area is simply too high to make this a cost-effective option.